When you analyse them and look for consistent themes, it is in my opinion no coincidence that they are all in their own way, highly successful. 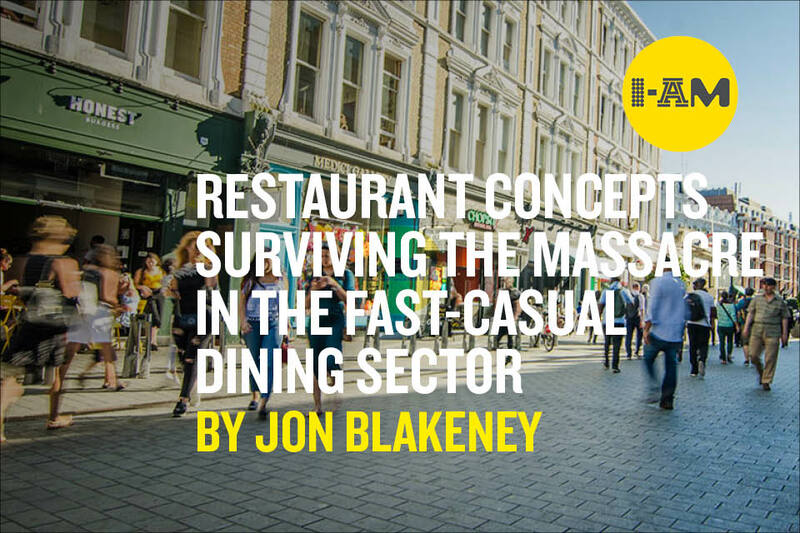 Based on the research, I have drawn together my top tips for success, not only for start-up restaurateurs but also the big behemoths who have lost their mojo. Tip one is grow slow. All of these brands have taken their time to develop, then expand. In the early years, one site a year seems to be more than enough for any business to manage. This strategy was beautifully expressed by Bobby Hashimi founder of Pizza Union, who recently explained the benefits of taking your time to fine tune the perfect model before expanding; they have grown to four sites in five years. Surely, case studies such as Jamie’s Italian have much to do with excessive expansion speed more than anything else. In the pursuit of rapid growth, quality inevitably suffers. My second tip for success is create a brand, not just a location. This factor definitely links these four food heroes. That’s not to say the likes of Byron don’t have an outstanding brand with real character, but it doesn’t come close to emulating the brand strength of Nando’s. When we talk about ‘brand’ we mean the responses you evoke in people’s heads and hearts, how you make them feel, think and act. This all needs underpinning with core values and a personality that helps you express your essence, in a memorable way, in other words, your way. Nando’s scores highly on all counts as typified by its campaign against malaria, their own lingo, such as Peri Boyz and a Cheeky Nando’s, causing a stir with bold stunts and rewarding loyal fans with the likes of their secret menu. Tip number three is keep it simple. At their core, all four of these successful brands have a mono product offering that has allowed them to focus their efforts. Keeping it simple allows you to communicate clearly with your audience, deliver food excellence by controlling your supply chain, remain competitive because you can buy in quantity, and most importantly carve your own niche in the market by standing for or owning something. This approach is best expressed by Flat Iron, who not only decided to own steak but a particular type of steak, the flat iron or blade steak. It’s a slightly cheaper cut that has allowed them to offer it at a great price and achieve their goal of shifting the idea of eating steak away from fine dining into the casual market, at £10 it becomes a lunch-time meal within reach of a huge millennial audience. This simplicity has also allowed Flat Iron to control their supply chain, hence reinforcing the quality of their anchor dish. How long before you hear people saying I’m off for a Flat Iron? My next tip for success is to have an unswerving focus on creating a hero product. This approach takes hours of dedicated effort, every day of every week, and it never stops. The big benefit of adopting this strategy, is that if it’s hard for you then you can guarantee that it will be equally hard for all those who seek to emulate your brand’s success. Some of the world’s best fashion brands use a model called the product pyramid; this model when applied to the restaurant world can achieve remarkable results. The product pyramid puts your hero product at the top, supported by seasonal items and then your basic essentials at the bottom. All outbound communication is then focused around your USP, hero product. By developing one truly great dish and then broadcasting it to the world, you start to carve out your own niche in a crowded market, you own something. Where would McDonalds be without the Big Mac, Nando’s without their peri peri chicken or Flat Iron without their flat iron steak? Tip number five is never stop innovating. Too many brands are far too eager to speed into roll-out and just replicate their model. This approach inevitably leads to failure as gradually standards drop, and customers start to leave. What’s needed is an almost obsessive focus on improvement, never being content with it’s OK. I can remember many hours working with Julian Metcalfe, founder of Pret and owner of Itsu. He’d already achieved more in the restaurant world than many others could only dream of, however every day he would pour over the details, obsessively challenging his team to innovate and achieve excellence. This approach requires a love of what you do, a drive and a determination to be the best. For me no-one exemplifies this approach better then McDonalds, who continue to drive innovation in a way that puts enormous pressure on their competitors. They were one of the first to go for drive throughs, self-service kiosks, table service via GPS, and fast-lane collection counters. That’s without mentioning their continued menu development with new innovations constantly hitting the market and stimulating awareness. My final tip for success is to create a value-added experience. One of the foundations that link all of the brands mentioned is that they go beyond just offering a good value product, they add value to their products by wrapping them in an overarching experience. The effect is to elevate the experience beyond what customers would normally expect, hence increasing advocacy and loyalty. By crafting distinct moments of truth throughout the experience, it’s possible to focus a brand’s energy where it will make the most impact on a guest, consequently creating the best return on investment. These elements of added value aren’t about spending big bucks, they are about the effect they have on the customer. When a member of the Honest Burger team crouches down beside you to take your order, it makes you feel special and appreciated. When you can sit at your table in McDonalds and order a top-up to your meal, which then magically arrives to where you’re sitting, you are definitely going to tell someone about it. When you sit in Flat Iron eating your £10 steak & lamb’s lettuce, you’ll definitely remember seeing today’s special roasting on the open fire, a treat to come back for next time. When value brands go the extra mile they cleverly bridge the gap between low cost and premium, it hits the sweet spot known as masstige. This approach allows a business to attract customers with great pricing but most importantly keep them coming back thanks to those premium touches that they like so much, those elements of luxury that they wouldn’t expect. Tip 1: Grow slow. Integrity is everything: In the pursuit of rapid growth, quality inevitably suffers. Tip 2: Create a brand, not just a location. Core values and a personality that helps you express your brand essence, in a memorable way, in other words, your way. Tip 3: Keep it simple. This allows you to target and communicate clearly with your audience, deliver quality by controlling your supply chain, be competitive as you can buy in quantity, and carve your niche in the market by owning or standing for something. Tip 4: Create a hero product. By developing one truly great dish and then broadcasting it to the world, you start to carve out your own niche in a crowded market, you own something, similar to a signature dish. Tip 5: Never stop innovating. Whether it is technology or food innovation, striving to consistently enhance you experience and product offer, to adapt to the changing customer needs and demands is the key to remain relevant. Tip 6: Create a value-added experience. Add value to your products by wrapping them in an overarching, distinctive and ‘ownable’ experience. The effect is to elevate the experience beyond what customers would normally expect, hence increasing advocacy and loyalty.